LOCATION: Walking distance to the beach! DETAILS: This beautiful home “Inn Seclusion” is tucked away in a private, gated and quiet community and is a short walk to the beach. The first floor features an open floor plan with abundant natural light. The kitchen is equipped with stainless steel appliances, granite countertops, and white cabinetry with lots of storage space. The adjoining family room offers a plush sectional sofa and mounted flat-screen television. The dining room table provides seating for 6-7 guests with additional seating for 5 at the nearby kitchen island bar. Guests can move from the interior living area to the back porch and to the outdoor living space. A heated pool awaits, where guests can soak up the sun in the comfortable chaise lounges, or relax from the shade of the outdoor dining table umbrella or on the covered porch. This quiet Florida cottage offers sleeping accommodations for 10 guests. The first floor guest room features a king bed with a flat-screen television and a shared bathroom with shower/tub combo. The second floor offers a master bedroom with a king bed, flat-screen television, private bathroom with glass-enclosed shower and double vanities. Also on the second floor is a charming bunk room with a subtle nautical-Americana theme, featuring two twin-over-twin bunk beds and a private bathroom with shower/tub combo and single vanity. The third floor features a king bed with a flat-screen television, cozy armchair, and a private bathroom with a single vanity and shower/tub combo. 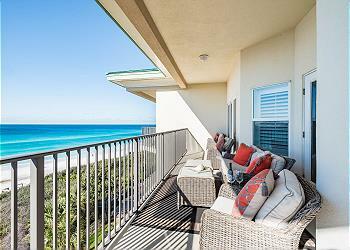 From the third-floor balcony, guests can enjoy views of the sugar white sand beaches and sparkling emerald waters. Take a short, palm tree-lined private walk to the beach. Use one of the home’s four beach cruiser bikes to discover of the charm and wonderful things that nearby Rosemary Beach has to offer. Enjoy a relaxing getaway at 183 Geoff Wilder Lane by contacting 360 Blue to book this property today! AMENITIES INCLUDE: 4 adult bikes provided, private heated pool. Complete Clean Linen Participant - ALL linens, including comforters laundered upon every checkout. Great location and pool was great. Enjoyed our stay and will be back. First time here. We loved it and will be back. 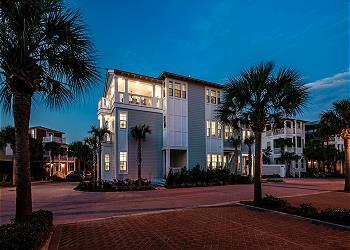 We are so happy you enjoyed your first trip to 30A! Thank you for choosing to stay with 360 Blue and we hope to have you back soon! First this property is very nice, but I would suggest that you take out insurance. This property management changed hands before we arrived for our visit, and I thought we had insurance from previous company. We had the unfortunate week of the biggest Hurricane to ever hit the area. Arrived on Saturday and were under a mandatory evacuation on Monday at 6pm. I was very disappointed that the owner or manage,ent company didn’t offer us any refund. Even after the Hurricane was over, power was off for 2 days, and the area was basically closed. We have been vacationing for several years in this area, I’m very disappointed in the management company and the owner of this property that nothing was offered. We were in the house for 48 hours, and had to pack up and leave, and couldn’t come back because of conditions. This was a one time occurrence, and would have liked to have had something offered. With that said, this is a great property, the house is large and beds are comfortable. wonderful stay and great place/location. We are so glad that you enjoyed your stay! Thank you for choosing 360 Blue, we hope to see you all again soon! We had a great time at Inn Seaclusion. The pool was great and the house was super convenient to everything. There were two couples and two 1 year olds in our party. The house was big enough that you had your privacy. We will definitely consider staying here again. We are so glad that you enjoyed your time with us in Seacrest Beach! We agree that this home is in a perfect spot to enjoy all that the area has to offer and having the private pool makes the vacation that much more enjoyable! We are looking forward to seeing you again soon! We loved the Inn Seaclusion. Easy biking distance to our tennis tournament, favorite restaurants, shops & the beach. The pool is so relaxing & a great hangout place. We usually travel as 8 women & no problems w/the bedding or rooms, very homey! We are so glad that you enjoyed your stay with us in Seacrest Beach! We agree that this home is situated in the perfect location to enjoy everything that this community and surrounding ones have to offer! We hope to see you and your group again very soon! It is the second time we have stayed at this property and we likr the house and location! Having the pool has been a big plus as well. We did notice the property is a lot more worn than it was last year. Needs to be painted and we noticed a lot of the nice decorations are gone... furniture, pictures etc. House was not as clean as it was upon arrival last year. We would however, consider staying here again. We are very glad that you enjoyed this home again this year! 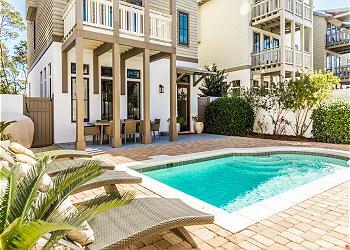 We agree that the location of this home is perfect and the pool is a great way to relax after a long day at the beach! We will be sure to share your valuable feedback in regards to the state of the home with our entire family in an effort to correct this for future guests! We look forward to seeing you again soon!